20.05.2016. Girls’ Day is a Germany-wide event offering insight into professions traditionally dominated by men. 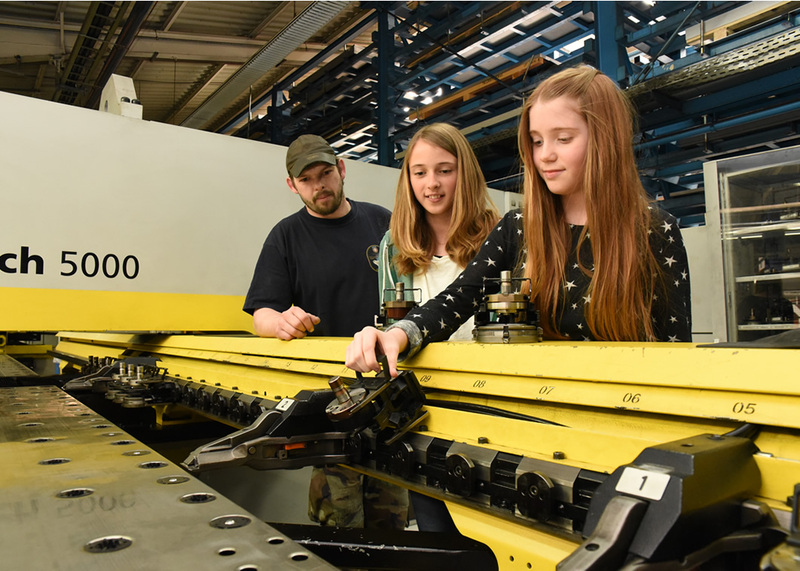 The Friedhelm Loh Group opened its doors to 33 young women at various sites, giving them first-hand experience of mechanical and electrical engineering. 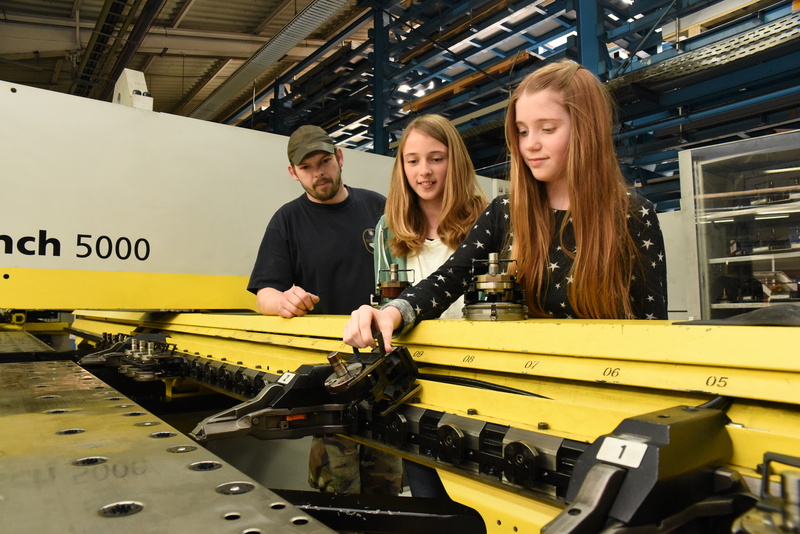 With a mixture of curiosity and enthusiasm, the girls literally got to grips with the world of manufacturing. At the Rittal training centre in Wissenbach, Viktoria is listening attentively as apprentices describe the layout of electrical circuits. Daniel Rink, Ludwig Schön and Marian Müller reinforce their simple explanation by showing the circuit’s technical ins and outs on a workbench. She was also allowed to play a more active role, using silver-plated copper wire and LED lights to create little figures. “It’s exciting. I’ve been interested in electronics for quite a while,” says the Year 8 (eighth-grader) student from the Johann-von-Nassau School in Dillenburg, whose interest in technology was sparked by physics lessons. The 16th national Girls’ Day saw Viktoria and 32 others encounter many aspects of engineering in practice, including production processes, software, shift work, and the operation of machinery. Seven students gained their first taste of industry in Wissenbach, another eight shadowed their fathers at the factory in Rittershausen – performing some tasks themselves. Alina Grajqevci, for example, finally discovered what her father has been doing at Rittal for the past 16 years: “It’s even cooler than I imagined,” states the 11-year-old. What do enclosures and shoes have in common? The Girls’ Day event attracted around 100,000 partici-pants throughout Germany. Eplan, the software specialist within the Friedhelm Loh Group, based in Monheim am Rhein, played host to 15 of that number – introducing them to tasks associated with the design of enclosures and IT racks. The attendees were suitably impressed by the ease and speed of the tools employed, drawing comparisons with shoe configurators in online shops. Eplan provides a variety of multi-year training programmes for school-leavers, some focusing purely on IT, some blending bits and bytes with other course content, such as business administration. In fact, the company offers 20 such courses – with women studying both “traditional” subjects, such office management, but also breaching typically male bastions, such as mechatronics. There are currently some 200 trainees and apprentices at the Friedhelm Loh Group as a whole. In addition, there are some 60 undergraduates from the Central Hesse University of Applied Sciences (THM). These students are on cooperative education programmes, combining higher-educational theory with practical handson experience in an industrial setting (StudiumPlus). Not all the attendees have firm career plans for the future. Viktoria, for example, states cautiously: “I am not sure what I want to do further down the road.” But she confirms that she would certainly consider one of the lines of work she has encountered during Girls’ Day. Alina, by contrast, is very enthusiastic: “This isn’t homework, this is real work.” Until now, she had wanted to become a vet – now she is having second thoughts. 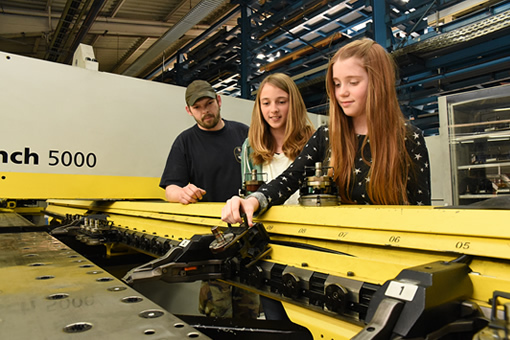 Image: Within the scope of Girls’ Day, a nationwide event in Germany, 33 young attendees gained hands-on work experience at the Friedhelm Loh Group.